Q I usually love autumn but I seem to have lost my fizz, and now have a cold – not a good look. Any ideas? To support the immune system and get us through the chilly seasons, we rely on a complete supplement called 10 Day Get Well Stay Well by 10 Day Results, £26.50 for 60 capsules. Start by taking two capsules three times a day for ten days to help immunity then take two a day as a maintenance dose. Hopefully it will help to ward off or at least shorten the duration and intensity of bacterial and viral attacks. If you do succumb to a virus, repeat the initial high dose until it goes. As a general energy boost, pharmacist Shabir Daya recommends Siberian ginseng, which we take too – and really notice the difference if we don’t. It’s an adaptogen, which essentially means that it helps where it’s needed. Shabir explains that it stimulates the adrenals to produce energizing enzymes that result in energy production, as well as increasing tolerance to different kinds of stress. Another option to put the fizz back on an ‘as needed’ basis is Bee Energised Energy and Focus by Unbeelieavable Health, £11.99 for 20 capsules. The dose is one to two capsules daily to support you in times of stress, fatigue, travel, or when you feel you need more focus and attention. We also love an acupuncture treatment when the seasons change (as well as for other things). Find a qualified local practitioner through the British Acupuncture Council. Just one more thing: if you go on feeling tired and below par, please do check in with your GP just in case there is some underlying factor such as iron deficiency. Now: a few beauty thoughts for the coldy bit. Your skin is likely to be dry so don’t skimp on moisturiser but let it sink in for at least five minutes before applying light foundation with concealer where needed – probably round your nose so remember to take it out and about with you. (Our latest greatest Beauty Steal concealer discovery is Maybelline The Eraser Eye Perfect & Cover Concealer, £8.99 from Superdrug.) Apply waterproof mascara so it won’t run if your eyes water. If you look really pale then a sweep of soft bronzer or pale blusher can help – but beware the dong with the luminous nose and cheeks look… Cracked lips will thank you for an undercoat of balm all over, then a soft pink lippy. 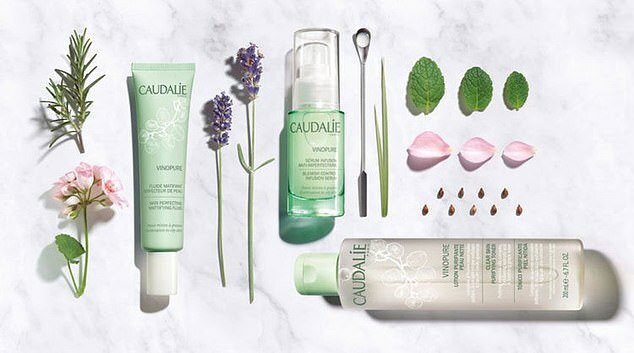 Caudalie Vinopure, from £18-£29. It fascinates us that while almost half of applicants to become Beauty Bible testers self-diagnose themselves as having ‘combination skin’, there are lamentably few products which set out to target this problem. High in naturals, Vinopure is formulated for combination-to-oily skin types, specifically targeting blemishes with three products that are in the upper 90% natural (that’s newsworthy in itself), and suitable for sensitive skins. Also notable: while pricier than the high street, it’s not outrageously expensive. The three new additions to Caudalie’s line are: The Clear Skin Purifying Toner, which (unlike many) doesn’t strip skin as you sweep it over face, neck and décolletage to clean away any surface debris and ‘prime’ skin for the other products.